A couple of weeks ago I was in New York City. Although I have been to NYC many times since I first visited it in October 1985, this was the first time I had spent the night in Manhattan. On the evening of Saturday 17th November I booked a ticket to go up the Empire State Building to take night-time photos. The cost of a ticket to the 80th floor is US$32, and I’d say that it’s good value. But, what is not is the extra $20 to go up to the 102nd floor. I had forgotten from my last time that this is not worth the extra money. Hopefully I’ll remember next time. I was on the observation deck of the Empire State (86th floor) for about 2 hours taking photos and videos. I’ll post some of them over the next few weeks. Then, at about 11:30pm I walked to Time Square. I stopped to get a coffee and warm up a bit so got to Time Square at about 12:30am. The place was heaving, hundreds of people were milling around and many of the shops were open. At about 1:30am I caught the subway to Brooklyn as I wanted to get a photo of Manhattan with the Brooklyn Bridge in the foreground. I took my photos from the Brooklyn Bridge Park, then walked back to Manhattan over the Brooklyn Bridge. By this time it was lashing it down with rain and I was soaked. The rain had seeped through my winter coat and my sweater and trousers were pretty much wet through. But, as I walked over the bridge I caught sight of the Statue of Liberty illuminated (it was about 3am by this time). So I decided to walk to Battery Park to take photos of her at night. When I got to Battery Park and set up my camera I discovered that my camera battery was dead from all the long exposure photos I’d been taking. So I got my spare battery out of my backpack, only to find that it too was dead. So, I didn’t get any photos of Lady Liberty at night. It was now 4am. I then walked back to my hotel which was in the Little Italy part of Manhattan. The rain was still lashing it down, and by now my phone was getting damp leading to Google maps misbehaving. The app kept on going haywire every minute or two, so I couldn’t use it to guide me back from Battery Park to Little Italy. Instead I just tried to figure it out, and it took me two hours! I collapsed into my bed at 6am, having spent nearly 12 hours wandering around nighttime Manhattan taking photos. When I was walking across the Brooklyn Bridge at about 3am this great Simon & Garfunkel song kept playing in my head. This song appears on Simon & Garfunkel’s last album Bridge Over Troubled Water. Written, of course, by Paul Simon, the “Tom” in the lyrics refers to Art Garfunkel. When they were teenagers in Queens they released a single and briefly called themselves”Tom & Jerry”. By 1970 Simon and Garfunkel were arguing and about to go their separate ways. Garfunkel decided to have a go at acting, he appears in the movie Catch 22. Simon is wishing him the best for his part in the movie Garfunkel is filming in Mexico. As is usual with Paul Simon, the song’s lyrics are exquisite. Here is a video of this beautiful song. Enjoy! As I write this blogpost, I am in Instanbul trying to get on a flight to Ouagadougou, the capital of Burkina Faso. I flew in to Istanbul on Friday, with my onward flight to Ouagadougou scheduled for Saturday evening (7th January). But, as we landed in Istanbul on Friday evening we realised that the city was being hit by heavy snow. In fact, the conditions on Friday evening were sufficiently bad that the pilot aborted his landing and took a second attempt to land. Saturday I woke up to continued heavy snow. I tried to find out what was happening about my flight via the hotel where I was staying, but no information was forthcoming. So, I made my way to the airport, only to be met by utter chaos. Thousands of people were stranded at the airport, with nearly all outbound flights cancelled. I was instructed at the check-in desk to join a queue to get my ticket changed for the next available flight. This queue stretched at least 400 metres, and it took over 4 hours to reach the counter to get my flight re-booked. My 18:40 flight to Ouagadougou (Burkina Faso) was cancelled on Saturday, along with most other flights from Ataturk Airport. Nearly all flights out of Ataturk Airport on Saturday were cancelled due to two days of heavy snow in Istanbul. I was told that there was no available flight the following day (Sunday), but that I was re-booked on the same flight to Ouagadougou on Monday evening (9th January). I was then told that Turkish Airlines would provide me with accommodation, and to join another queue down in the arrival area to be allocated my hotel. I then joined this second queue, about 250 metres long, and waited another 3 hours to reach the front of it. In groups of 40-50 we were led outside into the driving snow, each of us carrying our luggage (which could not be dragged as there was too much snow on the ground), to a coach/bus which took us to a hotel. In all I spent about 8 hours on my feet queueing at the airport, with no information forthcoming from Turkish Airlines. They did come along the queue on two occasions with sandwiches and refreshments, but no tokens were given to use any of the food outlets at the airport. On Saturday I was taken to the Best Western hotel in Istanbul. Everyone poured off the bus and then there was an almighty scrum at the reception to get rooms. I eventually got mine, by which time it was gone 11pm, and collapsed on my bed. We were told at reception, as we checked in, that a meal would be available in the restaurant, so despite my tiredness I went down to eat as I had barely eaten since breakfast. I spent most of Sunday relaxing, trying to recover from the physical and emotional rigours of the previous day. Snow continued to fall throughout Saturday and Sunday, and it is clear that Istanbul is not really geared for coping with snow. I cannot criticise this too much, as cities in the Disunited Kingdom are not either, snow is such a rare event that it is not worth investing the money in too much snow clearing equipment. So, the roads near the hotel were not cleared, and neither were the pavements (sidewalks), making it impossible to walk around. I just decided to stay in the warm of the hotel and try to relax. It was still snowing on Monday morning, by this time I would say about 15cm (6 inches) of snow had accumulated. In the morning I tried to find out whether my flight to Ouagadougou was going to be departing or not. Again, the hotel were not able to find out any information for me from Turkish Airlines. In addition, a promised shuttle bus to take we stranded passengers to the airport never materialised, so I had to get a taxi there, making sure I got a receipt which I will claim back from Turkish Airlines. My initial impression when I got to Ataturk airport on Monday was that things looked more hopeful than they had on Saturday. Looking at the departure board, there were far fewer cancelled flights. So, in great expectation, I went to the check in desk. I was told that they did not know whether my flight would be leaving or not, and to go to a different desk to find out. I went to that desk, to be told that the system was down and they could not tell me either. I then found a Turkish Airlines representative who was able to tell me that she felt there was a 90% chance that my flight would be cancelled. She gave me a piece of paper with a number for Turkish Airlines which I could call to reschedule/rebook my flight, instead of queuing as I had done on Saturday. As the queue was already as long as it had been on Saturday, I decided to accept her 90% probability and try to immediately join the queue to get yet another hotel for Monday night. The queue for accommodation was as long as it had been on Saturday, so after about 3 hours of queuing I finally reached the front and got led to another waiting bus. Except, this bus was further from the terminal than the one that I had been led to on Saturday, and no snow had been cleared since Saturday, requiring me and others to carry heavy cases for about 300 metres through 15cm of snow. No help was provided by Turkish Airlines or the airport in getting our luggage to the buses. Luckily I was travelling alone, I cannot imagine how I would have managed it had I been travelling with young children, as I have done in the past, and as many were on Saturday. Unlike on Saturday, on Monday I did not see anyone come around at any time with any sandwiches or refreshments. I was told by other passengers that most of the Turkish Airlines flights out of Ataturk on Monday had been cancelled. One guy that I spoke to had been delayed since Friday, so I guess he was in an even worse position than I was. Once again we were whisked off in the bus, this time to a different hotel. We all piled out of the hotel, the Point Hotel Taksim, and stood in a queue waiting to check in. 30 minutes later we still had not advanced, so I went to the front of the queue to find out what was happening. I was told by the lady at reception that the hotel had been given no notice by Turkish Airlines that we were being dropped off there, and that she was trying to call them to find out what was going on. Another 30 minute later and we found out that we had been dropped off at the wrong hotel, and that we should be at the Grand Öztanik Hotel “nearby”. When I asked how nearby, I was told “about 400 metres”. So, again we trudged off with our suitcases, unable to pull them due to all the snow on the ground, and made our way to the correct hotel, which indeed was about 400 metres away. The queue to check in at Point Hotel Taksim. We waited for an hour, only to find out that Turkish Airlines had dropped us off at the wrong hotel. We had to carry our luggage from the Point Hotel along this street to the Grand Öztanik Hotel, the correct hotel. Due to all the snow, it was impossible to pull our suitcases, they had to be carried the 300-400 metres between the two hotels. Again, I was thankful that I was not travelling with small children, or such a trek would have been very very difficult. I joined the now-familiar scrum at the reception, and got myself a room. By this time it was nearly 10pm, and I had arrived at the airport at 3pm. I had not had a chance to call Turkish Airlines to re-book my ticket, I decided to leave it until later the following day (today, Tuesday 10th January), when they MAY know what on earth is going on with their flights. We were told as we checked in that food would be available, so again I resisted the need to collapse on my bed when I got to my room, and made my way down to get something to eat. I then collapsed into bed, and this morning (Tuesday) I have woken up to see that the snow has stopped. I still don’t know whether I will be on a flight to Ouagadougou today or whether I will have to wait some more days. I tried calling the number given to me on the piece of paper at the airport yesterday, but no one is answering. As anyone who has read my blog will know, I have been lucky enough to do quite a lot of travelling. In the last few years I have typically been taking 8-10 international flights a year. So far I guess I have been very lucky as this is, as far as I can remember, the first time that I have been delayed in any major way. What has surprised me is how badly prepared Ataturk airport and Turkish Airlines have been for this eventuality. I cannot understand how a major international airport does not have decent snow clearing equipment, and for Turkish Airlines to be so unable to give any information on cancelled flights it appalling. The flight which I am trying to catch to Ouagadougou is scheduled to leave Ataturk each time it flies at 18:40. The incoming flight from Ouagadougou arrives in the morning, so I find it hard to believe that Turkish Airlines cannot tell me by 9 or 10am whether the evening flight is likely to leave or not. Certainly they should be able to tell me by 2 or 3pm, and yet they have not been able to. They really need to get their act together, or people like myself will stop flying with them. Tomorrow (Friday 25 November) I am boarding a plane which will eventually get me to Brisbane (Australia), via Seoul. Yes, I’m aware that Brisbane is not New Zealand, but in Brisbane I am joining a cruise which is going around New Zealand. The cruise will last for 14 nights, and I will give about 6 talks during the two weeks. The Princess Cruise leaves Brisbane on 27 November and returns on 11 December. I will be giving astronomy talks on the 14-night cruise. This will be the 5th cruise which I’ve done with Princess, and the 6th in total. The last time I did a cruise in the southern hemisphere was in February, when I cruised from Buenos Aires to Santiago around Cape Horn. Unfortunately, during that 14-night cruise, we had only one clear night! I am hoping for better weather this time, as in addition to my talks I run star parties to show the guests what is visible in the night-time sky. Many of the guests will probably be from Europe or the United States, and so will be very keen to see the Southern Cross. I will also show them the Magellanic Clouds if weather permits. The New Moon is on the 29 November, so the first week of the cruise will be ideal to see the Magellanic Clouds if the skies are clear. After that, the brightening moon will render them all by invisible. So, fingers crossed we get some clear skies during the first week! I am currently giving astronomy talks on a cruise around South America; by the time you read this the ship will be sailing up the Chilean coast after having been to Cape Horn, Ushuaia (the most southerly town in the World) and through the Beagle Channel. I was lucky enough to give talks on the same cruise in March last year, and jumped at the chance to do the same again. The cruise on which I am currently giving astronomy talks. 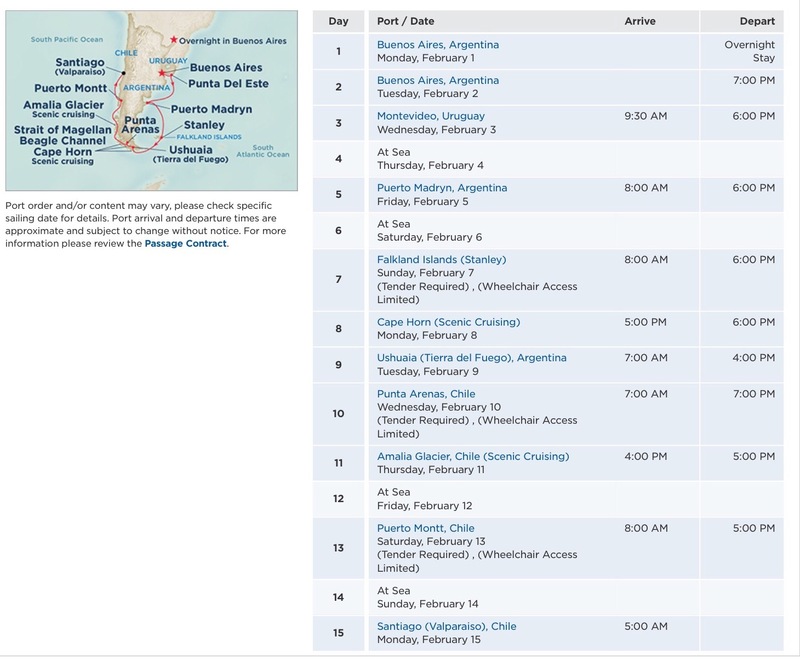 It left Buenos Aires on 2 February and will arrive in Santiago on 15 February. One of the highlights of this cruise from an astronomy point of view is being able to see the Magellanic Clouds, two satellite galaxies of our Milky Way galaxy. The first time these were seen by Europeans was back in the 15th Century by Portuguese and Dutch sailors. They were initially known as “Cape Clouds”. They were noted in 1503-1504 by Amerigo Vespucci (after whom the “Americas” are named). When Ferdinand Magellan and his ships circumnavigated the Earth in 1519-1522 the sailors on the ships noticed these two “clouds” in the sky which were visible from southerly latitudes. They were described in some detail by Antonio Pagafetta, who sailed with Magellan and, as a consequence, have become known as the Magellanic Clouds. 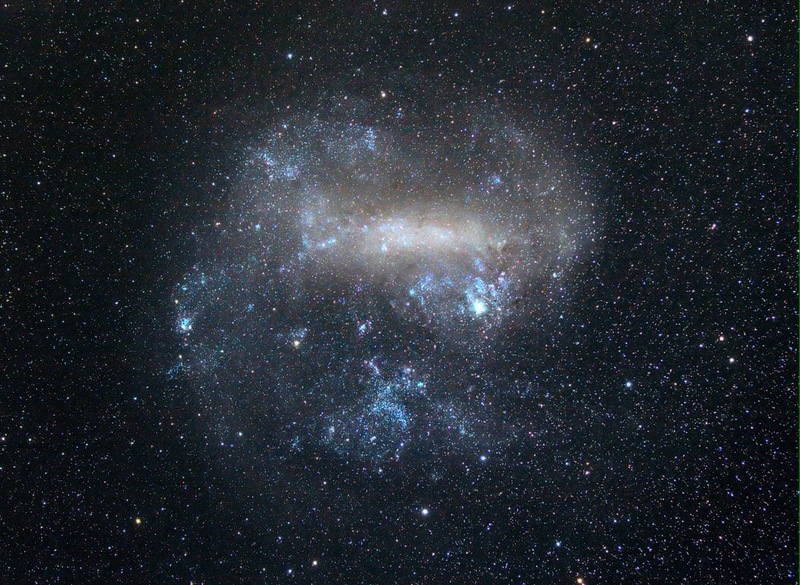 The large and the small Magellanic clouds (LMC and SMC) are not visible to people living in Europe or North America, as they lie too far south in the sky. In astronomy, we specify the position of something in the sky by its Right Ascension and Declination. 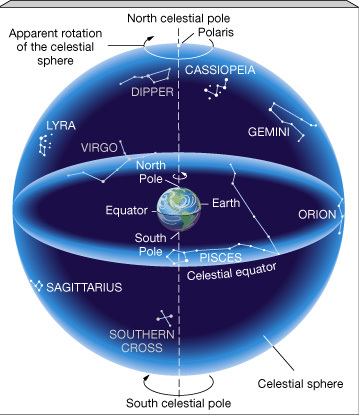 Declination is the celestial equivalent of latitude, and an object in the sky is either north or south of the celestial equator (which is just an imaginary line on the sky where the Earth’s equator would be projected if we imagine the Earth surrounded by the sphere of the sky – see the figure below). 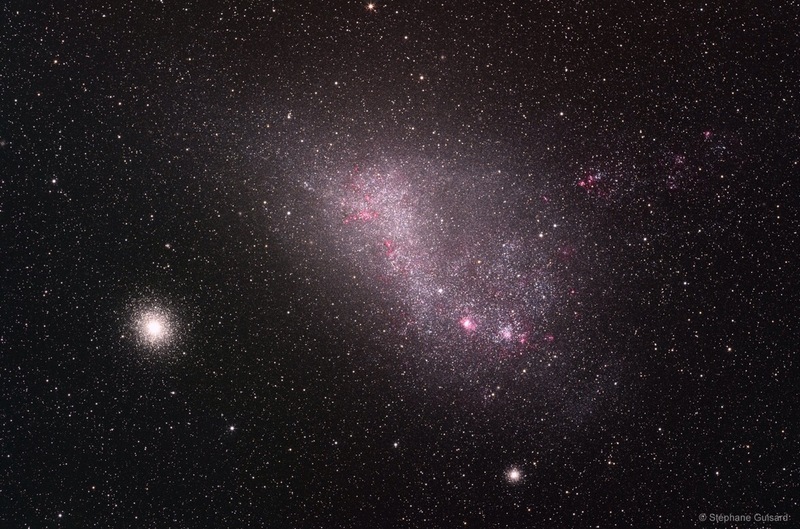 The SMC lies at a declination of about -73 degrees (73 degrees south of the celestial equator), and the LMC is at a declination of about -70 degrees. I say “about”, because they each cover a patch on the sky which extends for several degrees; these declinations are the objects’ approximate ‘centres’. What this means in practical terms is that you cannot see the LMC or SMC unless you are south of the equator. To be more specific, the furthest north you can be for the LMC to appear on the horizon is 20 degrees north, but practically you cannot see something unless it comes up about 10 degrees above the horizon; so you need to be south of about 10 degrees north of the equator to see the LMC. The same is true for the SMC, but it is a few degrees again further south in the sky. By the time you get down to southern South America, you are far enough south that the Magellanic Clouds become circumpolar, meaning they never dip below the horizon (the Plough, or Big Dipper, is circumpolar to most people in Europe and North America). There are many things I could say about the Magellanic clouds, but I will briefly mention two things, and I will expand on each of them in future blogs. 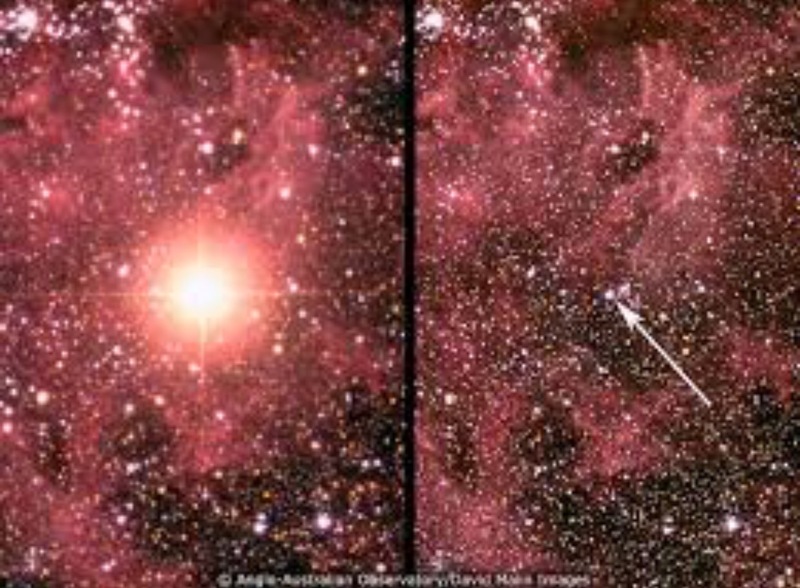 The last supernova (exploding star) to be visible to the naked eye occurred in the LMC in 1987 (SN1987A). Or, I should say, we saw it in 1987; it happened some 160,000 years ago because of the distance of the LMC. SN1987A is the most studied supernova in history, the last supernova to be visible to the naked eye before SN1987A was Kepler’s supernova, which was seen in 1604! We have learnt a great deal about supernovae by studying SN1987A. In 1912 Henrietta Leavitt made a very important discovery about some variable stars in the SMC. This discovery, which I will explain in more detail in a future blog, enabled us to measure the distances to very distant objects. It was used in 1923 by Edwin Hubble to show that the Andromeda nebula was, in fact, too far away to be within our Milky Way galaxy; the first ever proof that our Galaxy was not the entire Universe. By the time you read this I should be on an aeroplane flying from London to Los Angeles, and then on to Honolulu. I am returning to Honolulu for the first time since 1990; and both then and now my visits are for astronomical reasons. 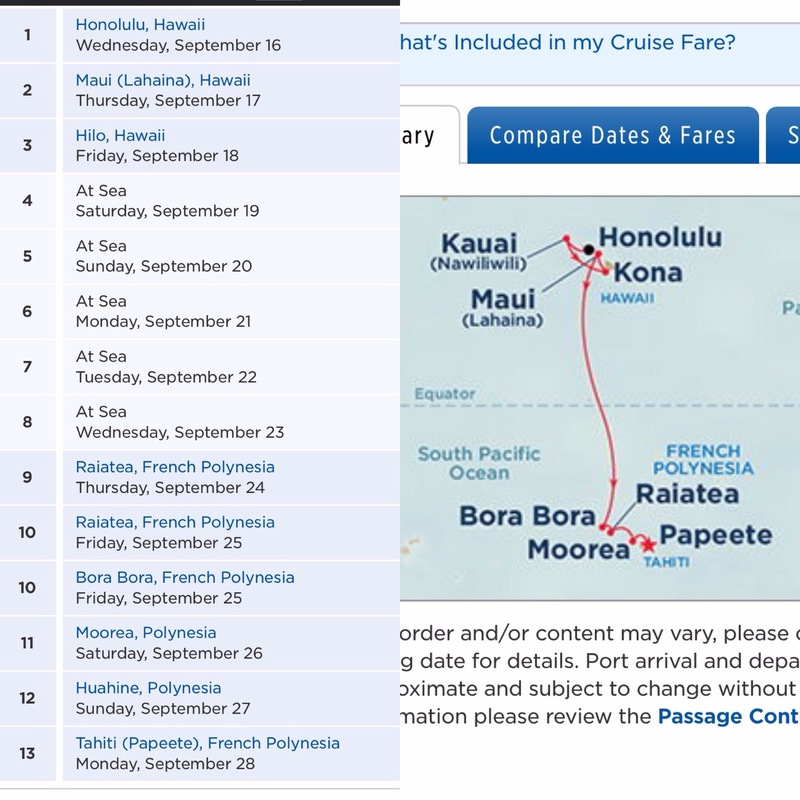 This time, I am joining a cruise to give astronomy lectures; the cruise goes from Honolulu and ends (for me) in Tahiti, twelve days later. Here is the route. Why is Hawai’i such a good place to do astronomy? The oldest light in the Universe – what is it and how was it discovered? Why was Captain Cook in Tahiti in June 1769? I also, on the days that I give lectures, run star parties on the top deck so that people can see the stars and planets. The only planets visible really during this cruise are Saturn (in the evening) and Venus (in the morning). This will be my fourth cruise, and my third with Princess, and I have found previously that the main problem in running the star parties is that they won’t turn off the lights on the top deck (for safety reasons), so seeing faint things like the Magellanic clouds becomes essentially impossible. I will see if I can persuade them to turn them off in specific places for my star parties this time. I will, of course, take lots of photographs of the beautiful islands I will be visiting, so expect a few blogs to come about from those in the future.